The JCR query object model describes the queries that can be evaluated by a JCR repository independent of any particular query language, such as SQL. 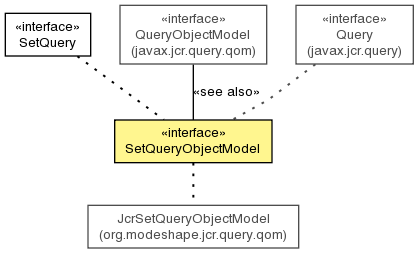 JCR defines the QueryObjectModel interface as the primary representatino of this query object model, but this interface is not sufficient for certain queries, such as unions or intersections of other queries. This interface is an extension to the JCR API that mirrors the QueryObjectModel interface for set queries.